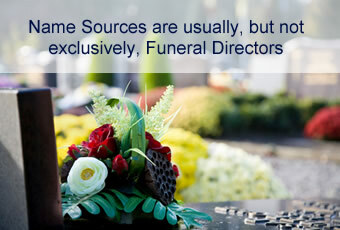 "Name Sources" are usually, but not exclusively, Funeral Directors. They play a very important role in our "Aftercare" program. First of all, the Name Source is our initial point of contact to, and entry into a community. In order to help us to set up the program, they aid us in the selection of community minded business leaders to be invited to sponsor the program and provide us with references. Please see sponsor benefits to learn about the benefits sponsors receive by participating in our program. Once the program is installed, the Funeral Directors provide the essential information we need to recognize each bereaved family to be served and to send them their copy of our memorial volume in a timely manner. There are a number of benefits for the Funeral Director. By displaying the volumes prominently in his lobby or by showing it to the family when they visit the funeral home, he will be providing to the bereaved a lasting keepsake to help cope with their loss. They also decide to which family member the volume should be directed. The Funeral Director is also able to safeguard the integrity of this high quality "Aftercare" program by personally selecting those businesses which are invited to participate.